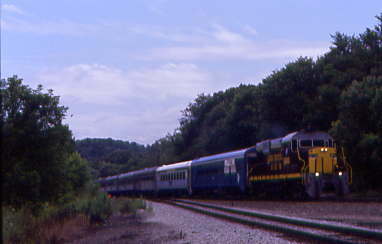 This would be the final excursion of the 2006 NRHS Convention as most passengers would ride a circle trip from Dennison to Morgan Run, switch directions to Brewster, then back to Harmon then onto Bowerston where the train would reverse back to Dennison. 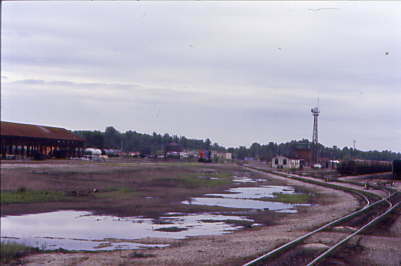 We would be riding on the Ohio Central to near Brewster, then the Wheeling & Lake Erie to Bowerston then the Ohio Central back to Dennison. 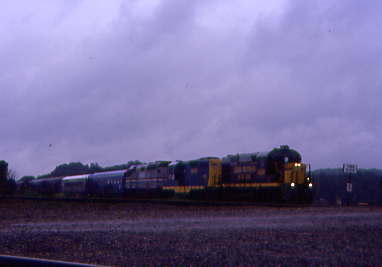 The train would leave Dennison on this rainy morning at 8:00 AM and arrive at Morgan Run by 9:15 AM. When Chris Parker and I got to the Morgan Run Shops this morning the Ohio Central 1293 was already steamed up and ready to go. 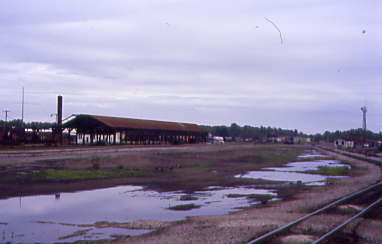 So you will see it here before the train arrived. 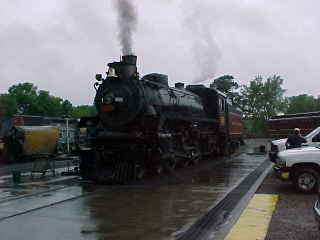 Ohio Central 4-6-2 1293, ex Steamtown, nee Canadian Pacific 1293 at the Morgan Run Shops which would be put on our train today from here to Sugar Creek. 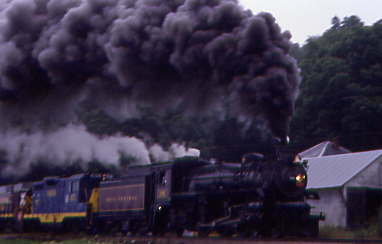 The 1293 then backed out of the shop heading for the mainline. 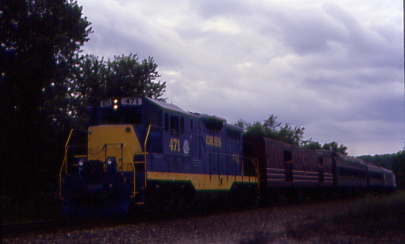 The Ohio Central 1293 then came forward on the mainline. 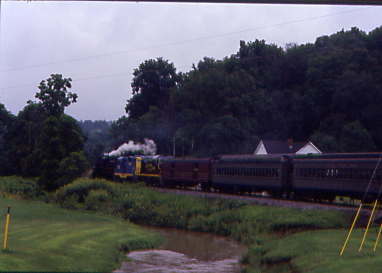 Our excursion train from Dennison pulled into Morgan Run with Ohio Central RS-11 1800, Orrville 471 and Ohio Central F40PH 271. 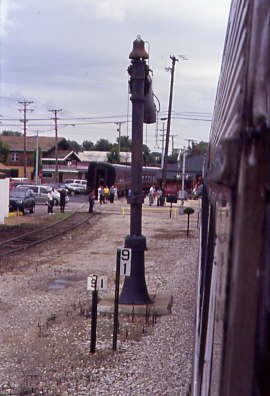 The Ohio Central 1293 waited to back onto the front of our train. I boarded the train very glad to be out of the rain and found that the car host in Pennsylvania Railroad RPCX 101 had saved some seats for us so I grabbed one for Chris and I. 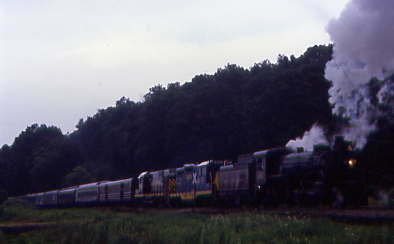 While I was doing that, the 1800 and 471 had cut off our train and went to the track the Ohio Central 1293 was on. 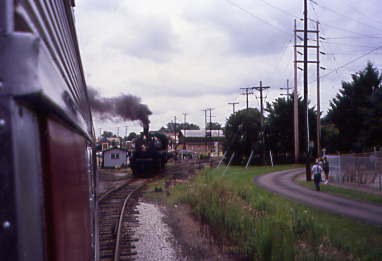 Next, the 271 pulled us down past that switch before Ohio Central 1293 and friends backed down onto our train. 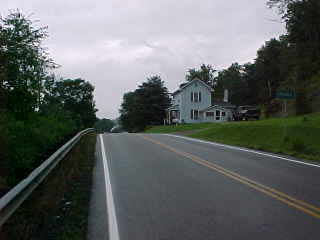 With us now facing the correct direction for Brewster, we departed Morgan Run. 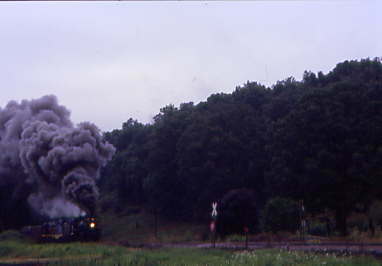 The Ohio Central 1293 took us out of Morgan Run northeast. I said goodbye to Morgan Run on a very wet day so far. They announced that we would do a Photo Runby in a few minutes so everyone got ready. 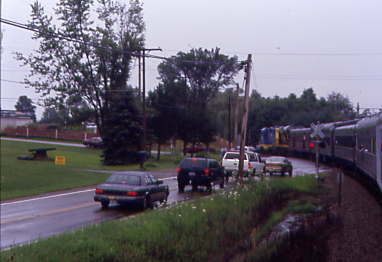 The train arrived at a farm crossing and we all got off, many with umbrellas. 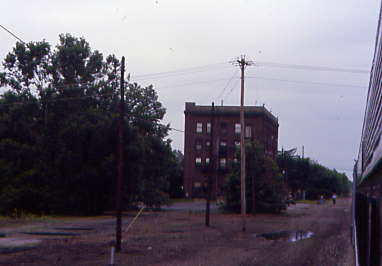 The photo line would be the edge of Ohio Highway 93. 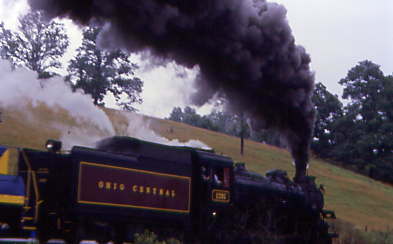 The Ohio Central 1293 waited to start its back up move. A call was made for all umbrellas to be put down and guess what, it stopped raining! 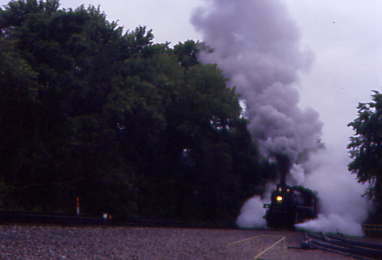 The Ohio Central 1293 did Photo Runby 1. 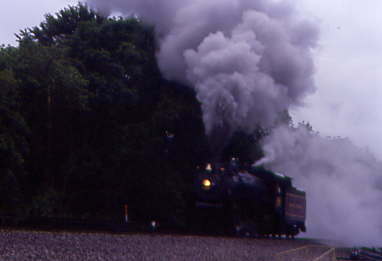 It was a great runby and soon we were back onboard the train and continued north. 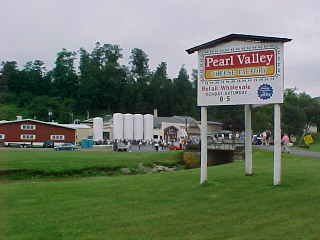 It was announced that the next stop would be the Pearl Valley Cheese Factory where we would be for about an hour. 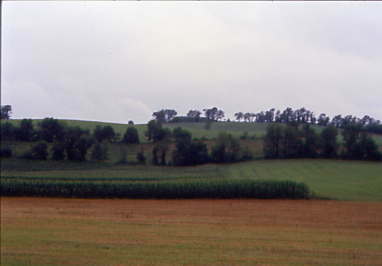 The train ran through the green Ohio countryside. 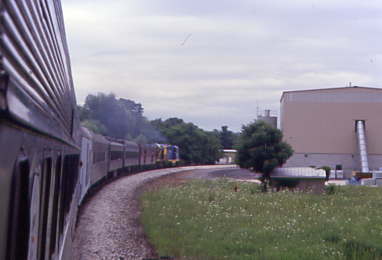 Upon our arrival at Pearl Valley, the train had to be split in two because of the factory entrance. 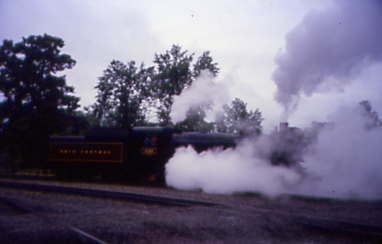 When I got off there, I walked down to the front of our train for a few pictures. 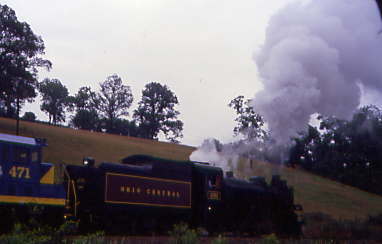 Our train at Pearl Valley. 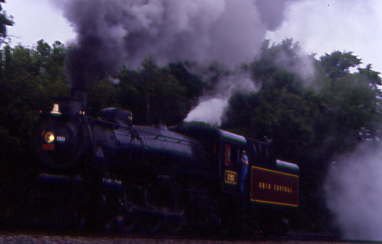 The Ohio Central 1293 at rest at Pearl Valley. 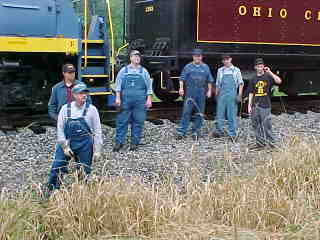 The Ohio Central Steam Crew. 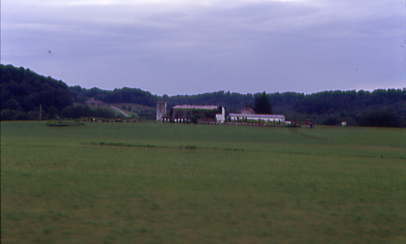 The Pearl Valley Cheese Factory. 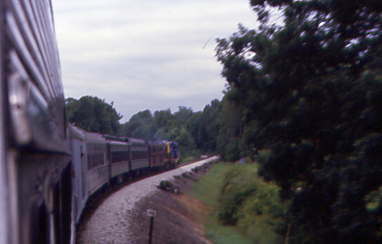 A different view of our train. Chris Parker was walking into the Cheese Factory. I had to walk out of Pearl Valley in order to get our train's drumhead with the NRHS 2006 Convention Emblem on it. 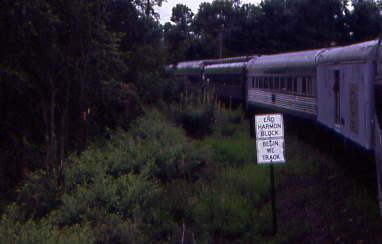 The drumhead on the Track Inspection Car. I had walked by barking dogs at the blue house on my way back to the train. 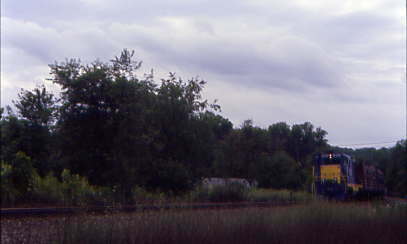 A view of the train and Pearl Valley. 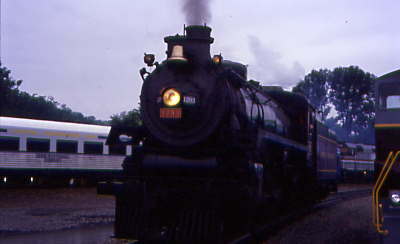 All the passengers who had detrained at Pearl Valley returned to the train and at noon, Ohio Central 1293 and our train departed for Sugar Creek. 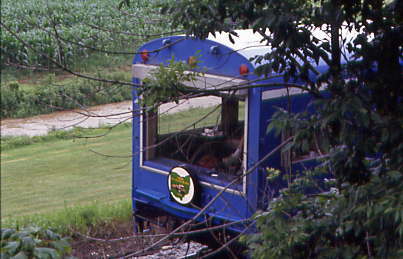 I just sat back and enjoyed the ride, having a Coca-Cola as the train climbed Baltic Hill. Right before Sugar Creek I got up to be ready for some picture taking. 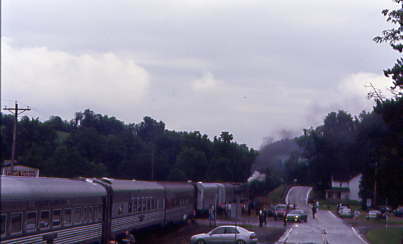 As we pulled into Sugar Creek, we first passed Ohio Central's passenger cars that were once used on excursion trains that ran from here. 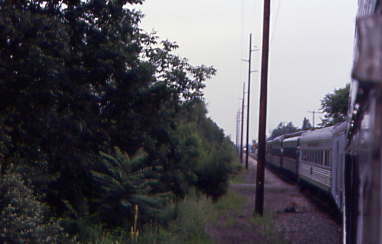 The other side of our train showed even more passenger cars. 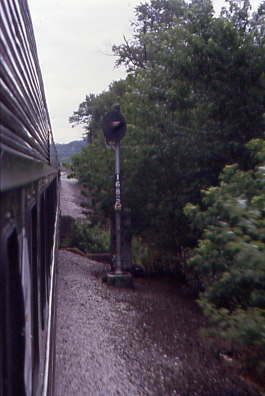 After Ohio Central 1293 had cut off our train and backed into a siding, we moved forward with the 471 and 1800, passing the water plug that the steam engine used back in the excursion days. 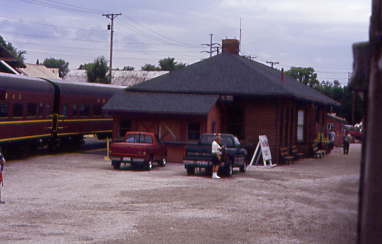 The Sugar Creek Station had even more passenger cars behind it. 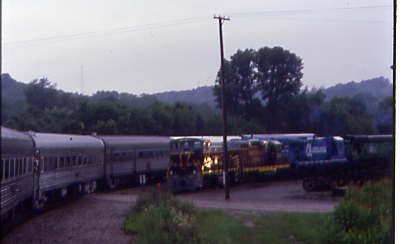 We said our goodbyes to Ohio Central 1293 and we thanked it for the two great trips it pulled for our 2006 NRHS Convention trains. I would now sit back and relax on this last convention trip. 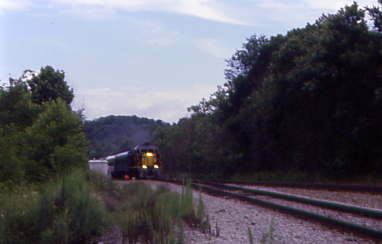 The train continued to climb after we left Sugar Creek. 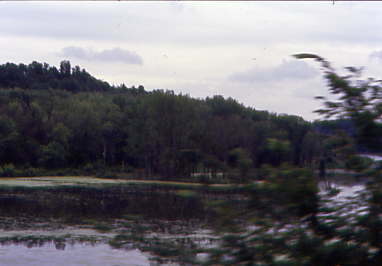 Our train passed several lakes on the way to Brewster. 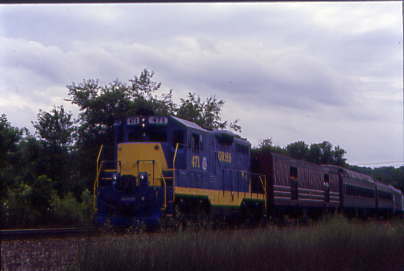 As we neared there, I used Chris Parker's cell phone to call Lets Talk Trains, that fantastic internet radio show that airs from 10:00 to noon Pacific time, or in my case today as I was in the Eastern time zone, it was 1:00 to 3:00 PM. With the call completed, I got ready for our arrival in Brewster. The rain started again but we were all happy it did not rain both times we had been off the train. 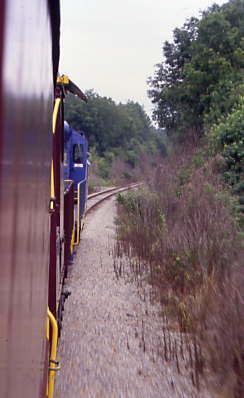 Our train took a tight curve as we crossed a local highway. 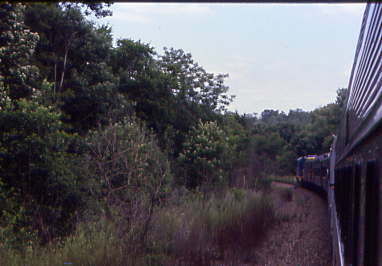 The train entered the Wheeling & Lake Erie tracks that we would be on this afternoon until we reached Bowerston. 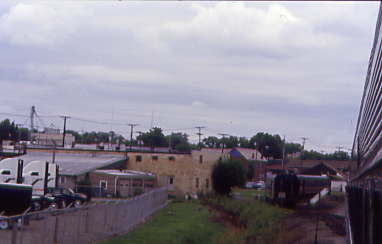 The train curved onto the W&LE mainline and headed west to the station. 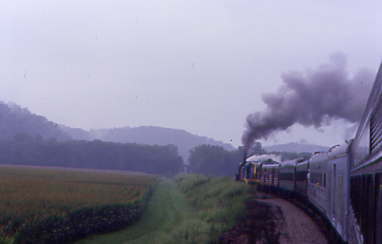 On the way, we passed a W&LE motive power set. 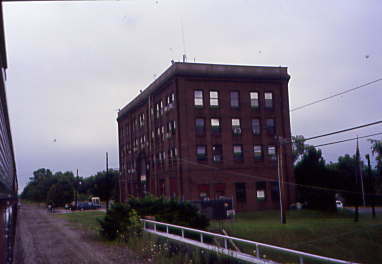 At the Wheeling & Lake Erie Station, we picked up our W&LE crew for our trip to Bowerston. 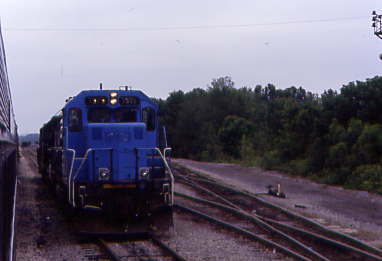 Once the crew was on, we continued to pull forward. 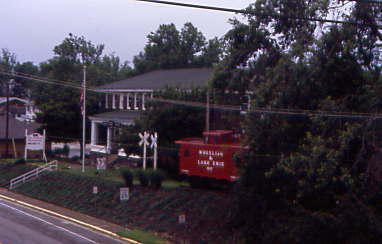 The passed the W&LE caboose at the Brewster Historical Society. 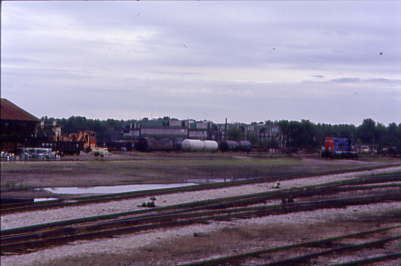 Views of the Wheeling & Lake Erie yard and shops. 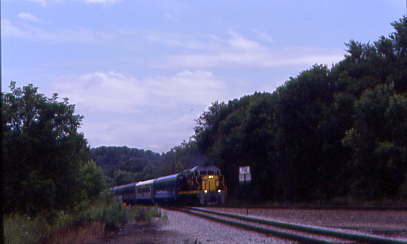 The train then backed down to the wye at Harmon which is where the line to Cleveland takes off. We reversed down the northwest leg of the wye and would take this leg to be pointed eastward. 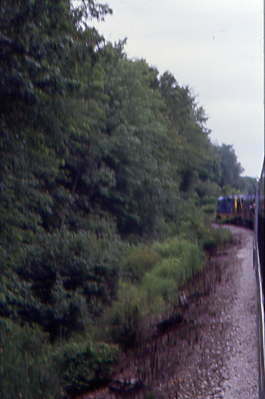 The train, now facing forward east, took this leg of the wye to reach the W&LE mainline. 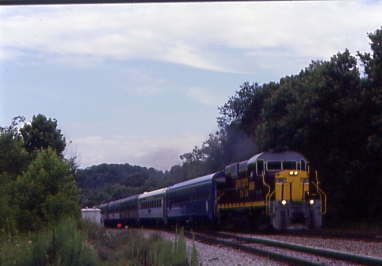 Our train has returned us to the W&LE Mainline and took off at the fastest speed of the entire Convention. 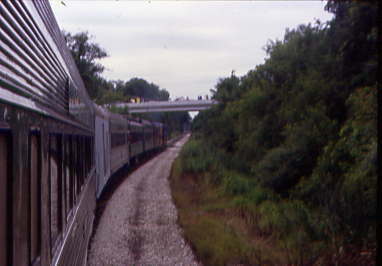 The railfans found us again on a bridge, most of whom we would not see again until Bowerston. 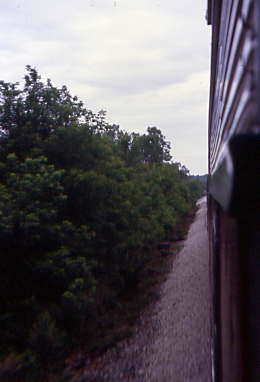 The train rolled along east at 40 mph down a very well-maintained railroad. 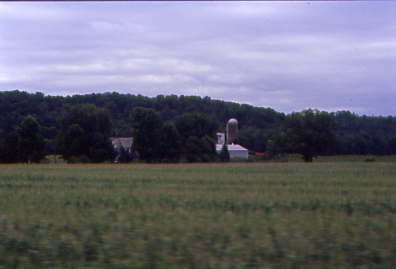 Passing another Ohio farm on the way to Bowerston. 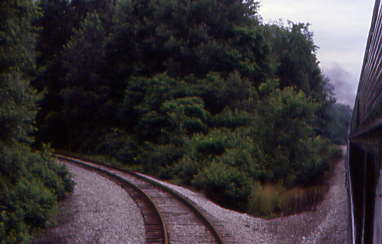 The train took this curve at Zoar. 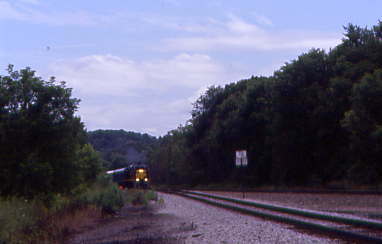 As the train took another curve we were at W&LE Milepost 44. 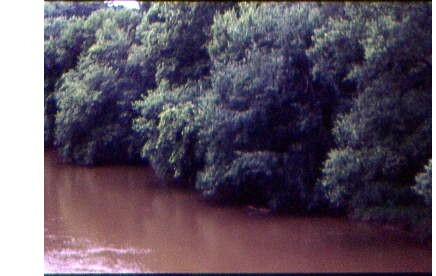 We crossed mostly muddy rivers on this trip from all the rains we had. 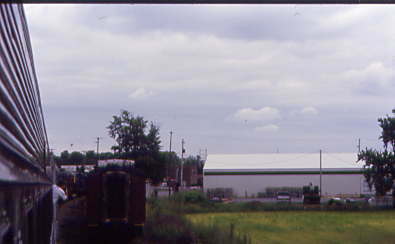 The train ran by more farms and I loved all the green Ohio had to offer me! A signal told me we were approaching Bowerston. 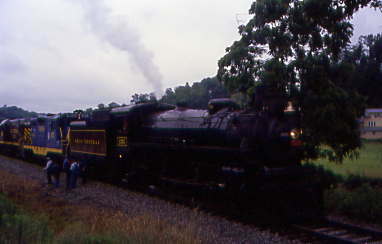 The train arrived at Bowerston and we stopped to change the position of our engines. 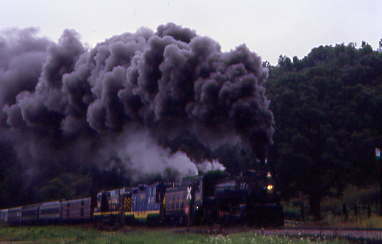 First the engines cut off from the train. 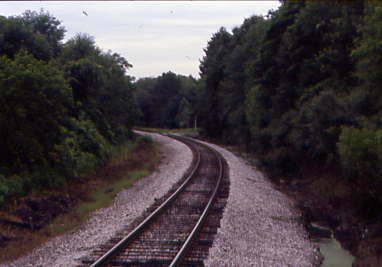 Next the 1800 cut off and went west onto the Ohio Central tracks. 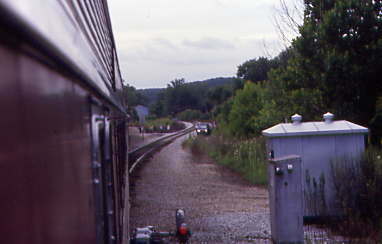 Then the 471 backed onto our train again and pulled us onto the Ohio Central mainline. 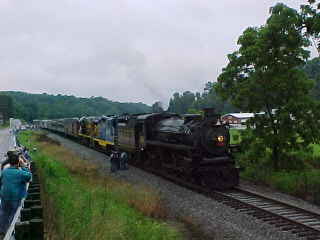 The Ohio Central 1800 returned to our train and pulled it forward to unload us for a double Photo Runby. 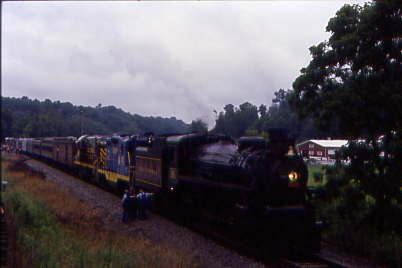 Once the train unloaded, it backed up to do a double Photo Runby, the last one of this year's convention. The train did Photo Runby 2. The train did Photo Runby 3. 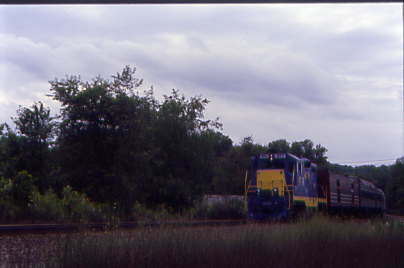 The train did Photo Runby 4. 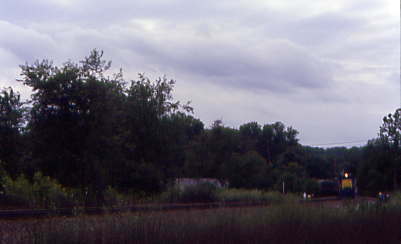 The train did Photo Runby 5. 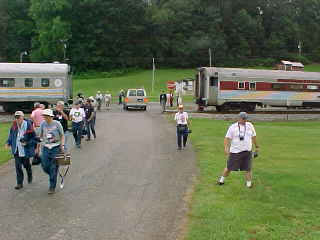 Our passengers then reboarded the train for the final miles of this last 2006 NRHS Convention excursion train. 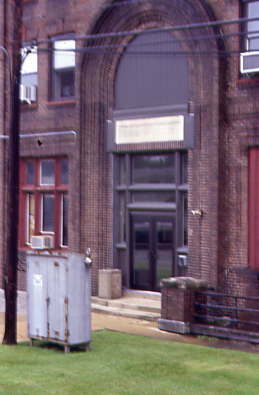 We returned to Dennison and the trip was over. 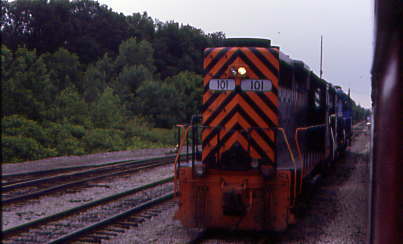 A special thank you to both the Ohio Central and Wheeling & Lake Erie Railroads. I was the first person off the train and in the front seat of the first bus to New Philadelphia. Chris Parker and I went to Hog Heaven for one last time for yet another excellent meal, before relaxing on our last night in New Philadelphia. Tomorrow we both head home, Chris on an airplane and me on Amtrak, which will be the last story of this trip.